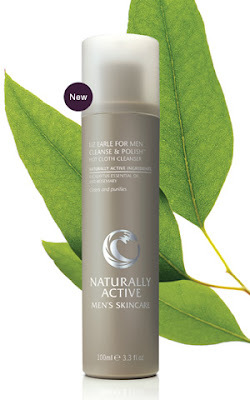 Meet Liz Earle Naturally Active Skincare For Men. Liz Earle’s philosophy for men’s skincare is simple… wash, shave and moisturize. You can’t beat this classic grooming combo to keep your skin in shape. Liz takes men's grooming to a whole new level with her Naturally Active Skincare For Men line. These are no-nonsense skincare products that are easy to use, perform phenomenally and smell great —clean, luxurious and masculine. The woman knows her stuff. She’s taken her botanical skincare expertise and applied it to her men’s line to tackle our skin situations. The result? Two thumbs up. I’m a huge fan of Liz Earle Face Scrub and more recently I started using some of her other products; Cleanse & Polish Hot Cloth Cleanser, Sensitive Shave Cream, After-Shaving Moisturizer and the Body Wash. They all hit my hot list. Give Cleanse & Polish Hot Cloth Cleanser a shot. It’s a fresh way to wash your face. How to do it: Pump a small amount of the cleanser (about the size of a nickel) on to your finger tips, then smooth the cream all over your face and neck. Massage it in to your skin, then rub it off using a hot damp muslin cloth (2 cloths comes with the cleanser). The cloth acts like a buffer and really gets the oil and dirt out of the pores. The result is amazingly soft glowing skin. Sweet! Liz Earle is now available in the U.S. — check it here. Sounds very interesting. How long are the cloths reusable for? I'm still rotating the original cloths that came with the cleanser and they are in good shape after many washes. LEAS recommends washing with white laundry and then hang to dry. They seem like they will last a while.